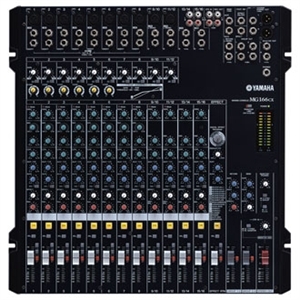 16 channels, 6 busses, and all the outstanding digital effects you'll need to built in. There's an astonishing amount of signal processing power packed into the compact chassis of the MG "CX" mixers. They incorporate a versatile digital multi-effect processor that provides a range of reverb, delay, modulation, and distortion programs you can use to refine and define your sound. Each of the 16 effect programs has a number of editable parameters as well as effect on/off switching capability and return level control. You can even blend the effects into the aux sends for quot;wetquot; monitoring, so the performers can hear the effects too. If you need to keep both hands free to play an instrument or perform other operations, an optional footswitch can be connected to the mixer's effect footswitch jack for convenient on/off switching. Top-mounted input and output connectors make setting up and re-patching your system quick and easy. All models feature high-quality Neutrik™ balanced XLR connectors on mono microphone/line channels and XLR-equipped stereo channels. These professional-class connectors were subjected to extensive testing by the Yamaha design team, and were chosen for the MG mixers for their superior reliability and sonic qualities. The XLR-equipped stereo channels can accept mono microphone input either via the XLR or phone jack connectors. The remaining stereo channels provide phone jack and pin jack connectors for compatibility with a wide range of sources. Mono input channels also feature insert I/O connectors that let you patch external signal processing gear into those channels as required. Separate pinjack 2TR inputs are provided to accept the output from a CD player or similar stereo source. This advanced feature can be a tremendous advantage in achieving great vocal sound, as well as to refine the sound of bass, guitar, and other sources. You won't find built-in channel compression on too many other mixers in this class, but in the new MG mixers you have Yamaha's innovative one-knob compression feature on several of the mono input channels. Conventional audio compressors with their threshold, ratio, knee, makeup gain and other controls can be complex and timeconsuming to set appropriately for a given source. Yamaha's one-knob compressor eliminates the need for an engineering degree with a single control that lets you simply dial in the amount of compression you want. The smallest models in the lineup - the MG82CX and MG102C - have a single stereo bus (i.e. two mono buses). All other models additionally feature one or two stereo group buses and outputs that can be used for convenient channel grouping. Assign switches for the stereo and group buses are located next to each channel fader.